On the 1st (Mon), pick up some local products at Savonlinna Market Square. 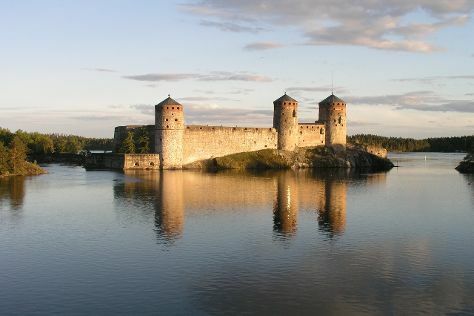 Quickly create a custom-made itinerary for Savonlinna using our trip planner. Tallinn, Estonia to Savonlinna is an approximately 8-hour car ride. You can also fly. July in Savonlinna sees daily highs of 24°C and lows of 13°C at night. Finish your sightseeing early on the 2nd (Tue) to allow enough time to drive to Kuopio. Kuopio is a city and a municipality located in the region of Northern Savonia, Finland. Start off your visit on the 3rd (Wed): test your problem-solving skills at popular escape rooms, then explore the activities along Valkeisenlampi, then get a sense of history and politics at Kuopio Market City Hall, and finally enjoy breathtaking views from Puijo Tower. Before you visit Kuopio, use our trip planner to discover what you can do and see there. You can drive from Savonlinna to Kuopio in 2.5 hours. Alternatively, you can do a combination of bus and train; or take a bus. In July, daytime highs in Kuopio are 24°C, while nighttime lows are 15°C. Cap off your sightseeing on the 3rd (Wed) early enough to catch the train to Tampere. Attractions like Sarkanniemi Theme Park and Hatanpaa Arboretum make great kid-friendly stops. Next up on the itinerary: take in the spiritual surroundings of Tampere Cathedral, enjoy breathtaking views from Nasinneula Tower, test your team's savvy at popular escape rooms, and get engrossed in the history at Emil Aaltosen Museo. To see traveler tips, reviews, and more tourist information, go to the Tampere online trip itinerary maker . Getting from Kuopio to Tampere by train takes about 3.5 hours. Other options: drive; or do a combination of flight and train. In July, daytime highs in Tampere are 24°C, while nighttime lows are 13°C. Wrap up your sightseeing on the 6th (Sat) early enough to travel back home.